Gemtech decided to do things right and create their own optimized round for suppressor usage. Putting together a heavier bullet, a cleaner powder, a premium lube on the lead round nose projectile gave us consistent velocities and harder hitting performance at subsonic, suppressor-friendly speed. The 42 grain lead round nose bullet is heavier than traditionally available rounds, but isn't so heavy as to cause instability. While "harder hitting" and . "22lr" aren't usually associated together, steel silhouette shooters will appreciate the difference between a knockdown and a wobbling target that stays up! A designed velocity of 1020 feet per second ensures the heavier projectile remains subsonic speed in most all firearms without resorting to anemic velocities. 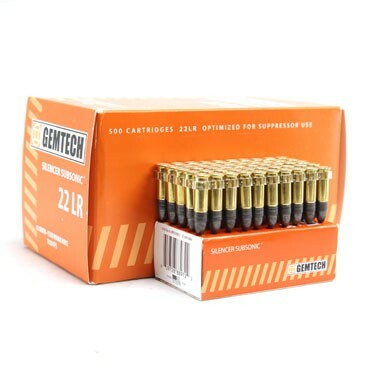 Gemtech indicates that the ballistic coefficient for the 42gr GEMTECH bullet is approximately .125 . Each box of 50 rounds contains a tray to keep bullet noses from any accuracy-robbing damage during transit. Ammo shipping runs a flat $18.95 for one box or many cases (case = 100 boxes) and ships UPS ground Adult Signature Only. Please no PO Boxes.